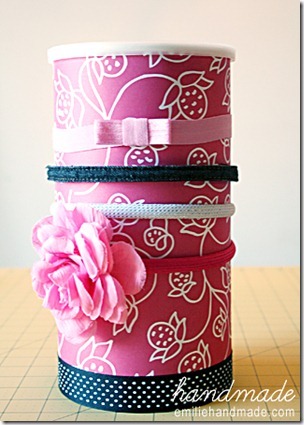 I saw this really cute idea for storing headbands the other day at Ucreate. The tutorial is actually over at Emilie Handmade. Just fancy up an oatmeal container or whatever cylinder container you have laying around and bada-bing bada-boom, no more headbands cluttering up the counter!